Perennial provides more than electricity. We also provide electrical safety training for all of our consumers including schools, organizations, and companies. Please call us to see if we can meet your needs. 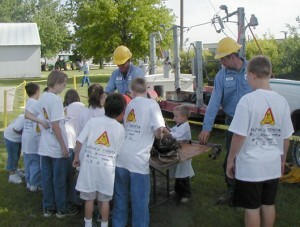 Perennial is ready to assist you in teaching students about energy and electrical safety. From Fire Departments to 4-H Clubs, Perennial is ready to come visit your organization and help educate your members on electrical safety. Call us today. Electricity is an essential part of our daily lives. It provides energy for water heating, home heating, cooling, cooking, refrigeration, lighting and all of our modern appliances. If electrical appliances are installed by experts and used wisely, it is a safe and economical energy source. But every year people are killed or injured by electrical shocks because they weren’t aware of the dangers or didn’t use electricity safely. Below are some basic electrical safety tips. Look up for power lines while moving tail equipment such as grain augers and other farm machinery. To avoid coming in contact with power lines while loading or unloading irrigation pipe, never stack pipe under power lines. Always look up first before lifting pipes to remove small animals such as skunks or rabbits. Never fly kits or model airplanes near power lines. If a kite does become entangled, contact your power company. Never try to remove the kite or plane yourself. Never climb on substation fences or enter them. If an animal or a ball should ever enter the fence, call your power company. Stay Away! Never climb trees or build tree houses in trees that are near power lines. Never use a metal ladder near power lines. Always use a fiberglass ladder and maintain a safe distance from the lines. Water and electricity don’t mix! If you plan to use a hair dryer near your sink, make sure your hair dryer is equipped with a GFCI cord or that you are plugged into a GFCI outlet. Never use a portable electric heater in a bathroom, and make sure that combustible materials are kept well away from heaters.